School Based Rehabilitation Services provides access to occupational therapy, physiotherapy, and speech-language pathology services for students with rehabilitation/habilitation needs. These services are provided in-school help students attend school, participate in school routines, and receive instruction in publicly funded education settings. As of January 1, 2019, Ron Joyce Children’s Health Centre manages School Based Rehabilitation Services via a contract with two service providers – Saint Elizabeth and CBI Health. What happened to School Health Support Services? School Health Support Services was the name of the program provided through the Hamilton Niagara Haldimand Brant Localized Health Integration Network (HNHB LHIN). The HNHB LHIN will continue to provide nursing, dietician and personal support to publicly-funded schools as directed through legislation, as well as therapy services to private schools and children who are home-schooled. School Based Rehabilitation Services include occupational therapy, physiotherapy and speech-language pathology for speech needs for school-aged children in publicly-funded schools. 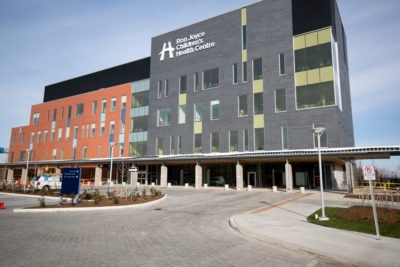 In addition to the name change of the program, Ron Joyce Children’s Health Centre will now manage the contract that is in place until December 31, 2019. RJCHC will work with Saint Elizabeth and CBI Health, who will continue to provide School Based Rehabilitation Services to school-aged children in their schools. The transfer of contract responsibility will not affect the current service delivery model for children currently receiving services, and families currently waiting for services will maintain their place on wait lists. Is there anything that I need to do because of this change? Children Currently Receiving School Based Rehabilitation Services: Services will continue without any interruption. Over the past number of months, the RJCHC has been working closely with our HNHB LHIN to ensure continuity of service for children and families and to support a smooth transition for the contracted service providers. Your child’s established service plan will remain unchanged. Children Waiting for School Based Rehabilitation Services: Families currently waiting for services will maintain their place on the wait list and children will continue to be seen on a priority-basis. Where will my child’s services be provided? Your child will continue to receive School Based Rehabilitation Services such as occupational therapy, physiotherapy or speech-language pathology in their school, based on the current plan for your child. Will my child’s therapist change? There will be no changes to service providers for children receiving services in publicly-funded schools. In the Hamilton r egion, School Based Rehabilitation Services will still be provided by Saint Elizabeth and CBI Health. RJCHC oversees the existing contract in place until December 31, 2019. In response to feedback received from families, the government is making changes to improve the delivery of school-based rehabilitation services (physiotherapy, occupational therapy, and speech-language pathology) for children and youth from birth to school exit. These changes will support a more seamless service experience as children start school or move between service providers, in settings that best meet their needs, regardless of where they live or who delivers the services. My child is on the waiting list for School Based Rehabilitation Services. Will my child come off the waiting list now? Families currently waiting for services will maintain their place on the wait list and children will continue to be seen on a priority-basis. How do I refer my child for School Based Rehabilitation Services? All new referrals for School Based Rehabilitation Services will continue to be done by the child’s home school through the Intake team at RJCHC. Please talk to your child’s teacher or principal about referrals for School Based Rehabilitation Services. My child is already a MCH-Ron Joyce Children’s Health Centre client. What does this mean for me? Your team at RJCHC will remain unchanged and will continue to work closely with service provider therapists in order to maintain coordinated care for your child.